Last year’s Intergovernmental Panel on Climate Change report on the science of climate change ended the need for any debate about its reality. Today’s report ends any debate about the need for urgent action on climate change – both mitigation and adaptation to its effects. This should mark an end to a period of global drift, inaction and backsliding on action to cut carbon emissions that might be dated back to the failure of the 2009 Copenhagen climate summit. Friends of the Earth says, rightly, it’s time to get angry about the failures. They are many, and global, but what I want to address here is UK politics, its past and future, what people and parties have said – and what they’ve done. A good starting point is the Climate Change Act 2008. It was a pretty good piece of legislation, with wide cross-party support. It was a framework for action. But since then, we’ve seen the action stall, and all too often go backwards, and the rhetoric, the standard of public debate in Britain, fall off a cliff. It’s worth noting that while this is a situation reflected in the United States, Canada and Australia, the nature of the debate at least in much of the rest of the world has been very different. In countries where political coverage is not heavily-dominated by right wing media tycoons and oil industry-funded “think tanks”, there’s been general acceptance of the reality of climate change, and perfectly reasonable debate about the best policy responses to it. Only in the Anglosphere have we seen such a trend, a fact surely not unconnected with the rise of aggressively climate sceptic Ukip in the UK (and the dreadful Tony Abbott in Australia). Last week I had a carefully typed letter from a genuine member of the public (not a ‘troll’), asking me why I scoffed at a Christopher Brooker’s article in the Sunday Telegraph. People whose news sources are such newspapers, and television, are presented with this scientific gobbledegook as though it were of equal value to carefully scrutinised and peer-reviewed work of thousands of actual scientists. They believe them – or at least they are confused. We might have expected more sense from the BBC, but there are some senior, dominant on-air figures whose personal views have been allowed to run riot, and since 2010, the institution has been visibly running scared of the right wing government and the future of its licence fee. The Green Party’s Finance Spokesperson Molly Scott Cato put the point very well on Twitter this morning: “Esp 4 journalists, this is morning for deciding which side you are on, that of your grandchildren or the one your bread is buttered on”. Since 2010, in government policy action, where we haven’t seen inaction, we’ve seen wrong action. There were the two fiascos over the solar feed-in tariff; a new low with the leak of David Cameron’s “green crap” (“crap” including measures to insulate the homes of the poor and vulnerable and help them pay their taxes – the rate of the first of these having since been slashed); the Green Deal – an “energy policy” designed by the finance industry for the finance industry; the plan to build lots of new roads (the ones dismissed as “zombie” projects in the Eighties), and the pursuit of the high-energy, low-sense High Speed 2 rail line. And then there was fracking – the point at which government energy policy descended into dangerous fantasy. We had a Lib Dem Energy Secretary – the same one who’s now standing up today saying he wants action on climate change – saying “I love shale gas” not once, but twice, in case anyone missed it the first time. There’s PM David Cameron insisting that British shale gas would cut energy prices, even though the frackers themselves deny it, and only this month claiming that production would start by the end of the year, when the industry themselves says in five years they’ll know if there’s the possibility of an industry. In February – after the floods, Cameron had to issue a statement saying he believed in climate change, so strong had the doubts about his views become. The same week Chancellor George Osborne was forced to also reassure us that he did believe in the science – although he quickly added that he only wanted to do cheap things to tackle the problem. And Labour? Well Labour are apparently in favour of fracking (although in affected areas there are reports of quite different local claims), in favour of HS2, yet to offer any opposition to road-building that I’ve seen, and aren’t backing programmes such as the Energy Bill Revolution (that could create jobs, almost end fuel poverty and cut emissions). In fact, they are offering little more than hot air. The three largest parties have comprehensively failed to stand up for the facts, for the science, for the reality on climate change. They’ve offered only weasel words, and disastrous deeds. Our future, the future of our children and grandchildren, demands a lot more. I can give you many reasons to vote Green on May 22, for the European and council elections, and in the 2015 general election. But even on its own, the promise of real, effective action that would not only slash carbon emissions but create jobs and build the wellbeing of all, but particularly our poorest, is, I believe, an overwhelming reason. Jean Lambert MEP has warned that the Transatlantic Trade and Investment Partnership (TTIP) damages democracy, threatens the future of the NHS and should be scrapped. 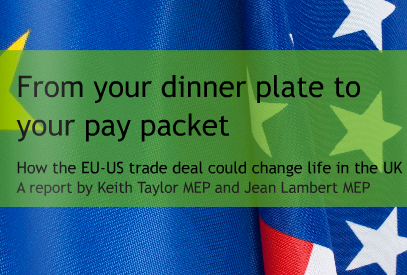 Speaking as negotiations between the European Commission and the US enter their fourth round in Brussels, Lambert said the free trade agreement could override important EU and UK laws which set standards and protect services – on issues such as food safety, data protection, health and the environment. The London MEP was speaking at the launch of a joint report from her and Green MEP colleague Keith Taylor, which highlights some of the many dangers of the agreement to UK sovereignty. The right to access public procurement – government spending, which could include the NHS – forms a major part of negotiations. Transnational corporations from the US would have the right to enter the UK market – with ‘regulatory harmonisation’ between the EU and US companies leading to standards being watered down. There is also the prospect that the UK government could be sued if it introduces regulations that might limit the future expected profit of services, making the liberalisation of services virtually irreversible. Greens are the only major group in the European Parliament which currently opposes the trade deal. “These deals being made behind closed doors will have serious consequences for our rights – they will see democracy losing out to corporate power. “We already know the Tory-Lib Dem coalition don’t care about our public services staying in public hands – but this deal could stop future governments reversing their damaging privatisation agenda. “The deal threatens to open the NHS to US companies, and close the door on a future government putting patients back before profits. “This trade deal is not about free trade, but a free-for-all, slashing regulations in favour of big business. 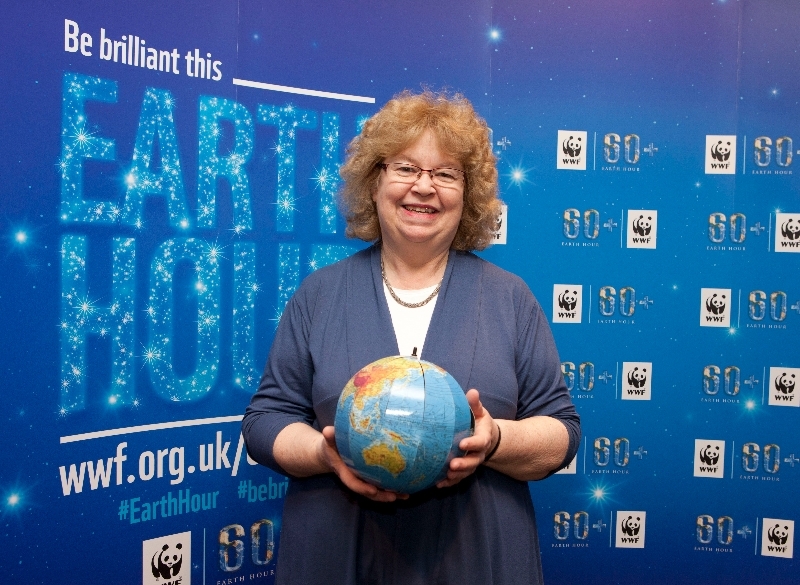 Jean joined WWF at the European Parliament in Brussels to show her support for Earth Hour 2014, the annual global lights out event which takes place tomorrow (Saturday 29th March) at 8:30pm.